Is MENA’s Undernourishment Getting Worse? One of the targets of the Millennium Development Goals for poverty and hunger is monitored in part through a measure called Prevalence of Undernourishment. This is defined in the World Development Indicators (WDI) database as the proportion of the population whose food intake is insufficient to meet minimum dietary energy requirements continuously. Comparative data (see figure below) show two, somewhat contradictory, aspects of undernourishment in the Middle East and North Africa (MENA) region. During 1991-2012, the MENA region has had very low levels of undernourishment; among developing regions, it is tied for lowest average with Europe and Central Asia. But the average level of undernourishment in the region appears to have worsened over time. The latter is surprising because the MENA region is made up of middle and high income countries (with the exception of Djibouti and Yemen) and has not been subject to any prolonged negative food or income shocks in the past two decades. Indeed, all other regions have experienced a steady decline in undernourishment since 1991. Is undernourishment really worsening in MENA? To answer this question, it is useful to unbundle the average regional score into its country components. Of the sixteen MENA countries included in the WDI database, ten have experienced declining or flat levels of undernourishment since 1991. Another three (Algeria, Iran and Morocco) have experienced some episodes of rising undernourishment for a few years but their average level at the end of the period (during 1998-2012) was the same as or lower than at the beginning of the period (during 1991-95). Only Yemen, Iraq and West Bank/Gaza had an average level of undernourishment that was higher at the end than at the beginning of the relevant period. 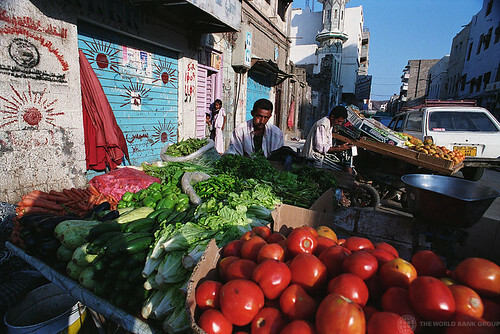 Yemen started the decade of the 1990s with about 29% of its population undernourished. The proportion crept up to 32.7% in 2008 before declining to an average of 30% over the last three years. This pattern is consistent with Yemen’s two decades of slow economic growth and persistently high poverty rates. The Iraqi and Palestinian experiences are even more troubling. Only 10% of Iraq’s population was recorded as undernourished in 1991. Two decades of war, sanctions and civil strife have more than doubled this proportion to 26.2% in 2012. In West Bank/Gaza the proportion of undernourished has also more than doubled from 14.7% in 1996 (when monitoring began) to 31.8% in 2012. Externally imposed restrictions on the movement of goods and services into the area and the devastation caused by periodic military actions are the likely causes. In any case, the deterioration of undernourishment in MENA is due to the experience of only three countries (with a combined population weight of 15.6% in 2012) and should not be interpreted as indicative of region-wide stress. Indeed the true picture may actually be one of average improvement but we can’t tell because of the following rule that seems to govern the reporting of the data: no score of better than 5% is registered. So if a country has reached a score of 5% no further improvements are recorded, though deteriorations from this level are noted. This is the case with eleven of the countries in the MENA average. It is also the case with rich developed countries which is why the average score for the OECD is shown as a flat 5% since 1991. Do you have any data that compares undernourishment in MENA to obesity and/or non-communicable diseases? The India example you cite suggests that the undernourishment variable cannot be used as a reliable guide to under-nutrition status. However, regarding its use as a measure of differential access to food, the statistical note in the WDI database says that the variable measures "food deprivation based on average food available for human consumption per person, the level of inequality in access to food, and the minimum calories required for an average person." This suggests that it does capture some aspect of differential access to food by income or socioeconomic status level. Perhaps not very well? Thank you for sharing information on the shocking and steep increase in undernourishment in Iraq and in West Bank/Gaza. It is impossible to overlook the impact of conflict on the continually deteriorating health of these populations (undernourishment being only one of many other health aspects). Also, someone had a question about obesity/non-communicable diseases (heart disease being the leading cause of death & disability, while high blood pressure being the 2nd). In the Economist pocket world in figures 2013 - several MENA countries land in the global top 20 for obesity (http://my.safaribooksonline.com/book/personal-and-professional-development/9781846685989/health/lev0176_html)... with challenges existing in parallel.. in Egypt, 30% of children below five years of age are stunted, while 20% within the same age category are obese (with stark urban/rural discrepancies).